We’re all guilty of falling off the wagon sometimes. You know what I mean: Having that sneaky pizza slice (or three), and who can resist fries? But it’s no secret that fast food isn’t healthy. No matter how hard we may wish our favourite cheats had zero kilojoules, the fact is they’re bad for us. “We generally refer to take-away food as energy dense and nutrient poor as most take-away foods are deep-fried processed meats and starches. As a result, they’re high in energy, salt and fat, and low in nutrients like vitamins and fibre,” explains dietician Anika Barnard. 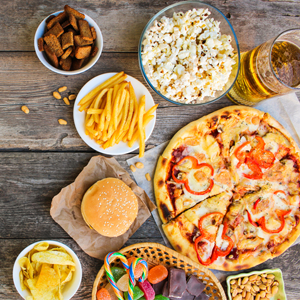 Many South Africans opt for fast foods because they’re often advertised as value for money. So, for as little as R100 you can feed a family of four (or yourself). You’re given huge potions, which you most likely finish, leading to unintentional overeating. And all of that overeating honestly just gets in the way of you reaching your health goals. But we all know that life happens and sometimes fast food really is the easier option. So, here are some take-aways for the next time you have, well, a take-away. We all love a juicy burger or hearty steak, but if you’re able to, avoid the red meat. Barnard advises opting for fish or chicken, and go for grilled over fried when available. Fries before guys, right? In this case, no. Switch your deep-fried chips to a veggie side like a salad or stir-fry. “This decreases the fat and energy content of the meal and adds fibre and some micro nutrients,” says Barnard. Choose a sugar-free beverage, like diet cool drinks or water. If possible, ask for sauces on the side. Always hydrate before eating – sometimes thirst is confused with hunger pangs. Choose a kiddies’ or regular portion and say “no, thank you” to the “up size?” question.